What can you make with 93 miles of yarn? A statement. Women rule the world right now. Simone Biles broke records at the Rio Olympics. Hillary Clinton is in the running to become the first female president. Beyoncé broke the record for all-time VMA wins this year. Women can do anything and their power deserves to be celebrated. That’s why artist OLEK united female refugees to crochet an entire house in pink yarn—to prove women, no matter their situation, can get back on their feet and rebuild their lives. 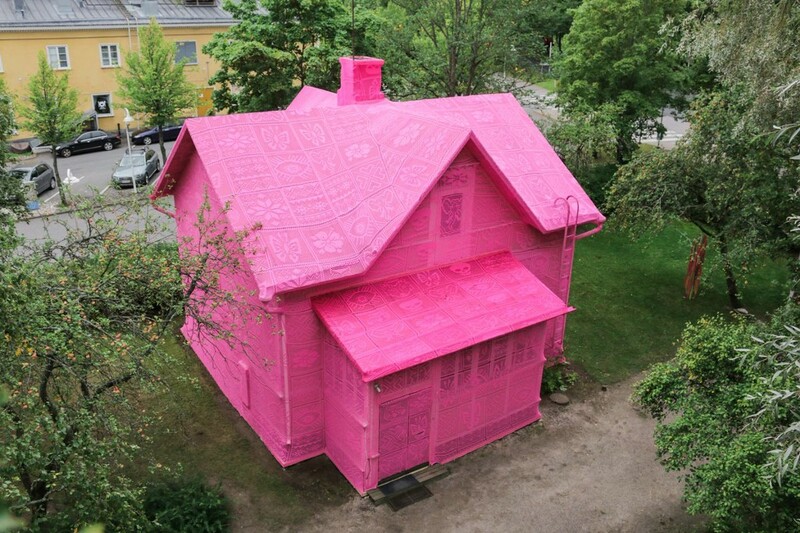 OLEK and refugee women from Syria and Ukraine used 93 miles of yarn to cover two houses in Sweden and Finland. OLEK, whose artwork typically focuses on feminism and sexuality, started the project in Avesta, Sweden, working to crochet a house to shed light on the plight of people who lost their homes due to war. The second installation is in Kerava, Finland. OLEK’s team gave the 100-year-old home a fairytale-like makeover to show “a symbol of a brighter future for all people, especially the ones who have been displaced against their own wills,” according to Mental Floss. OLEK inspires us by using her artwork to spread an empowering message that speaks to females around the globe. See the process in the video below and check out her Instagram for more behind-the-scenes pictures!